The Ministry of Foreign Affairs (MOFA) of the Republic of China (Taiwan) launched the e-Visa Program on January 12, 2016. This simplified visa policy saves applicant’s time, traffic hassles and money. The applicant doesn’t need to physically apply in the embassy or consulate. Travelers of certain nationalities eligible for an e-Visa must obtain an e-code from their host organizations in Taiwan prior to applying for an e-visa. To obtain the e-code, applicants must be invited to attend international conferences or activities in Taiwan – organized, co-organized or sponsored by central government agencies or certain non-governmental organizations. An e-Visa is an official document issued electronically by ROC overseas missions that allows foreign nationals to enter and travel in Taiwan. When an e-visa application has been approved, applicants are required to present the printout of the e-visa at the immigration checkpoint for verification upon arrival in Taiwan. Your passport with validity of at least six months as of the date of intended entry into Taiwan. The validity of the Taiwan e-Visa is three months starting from the issue date. The e-Visa is a single-entry visa and the maximum duration of stay in Taiwan is 30 days. The Taiwan e-Visa cannot be extended or converted to any other type of visa. Taiwan e-Visa holders can enter Taiwan on any date within the period of validity (three months). e-Visa applicants must possess an ordinary, official or diplomatic passport with validity of at least six months from the date of intended entry into Taiwan. The traveler is required to present a paper copy of the e-Visa at the immigration checkpoint for verification by the National Immigration Agency upon arrival in Taiwan. e-Visas are granted for tourism and business purposes, as well as for visiting relatives and attending international conferences or sporting events in Taiwan. If you are not from one of the following countries, you are required to obtain an e-code from your host organization in Taiwan: Bahrain, Burkina Faso, Colombia, Dominica, Ecuador, Eswatini, Kiribati, Kuwait, Marshall Islands,Mauritius, Montenegro, Oman, Palau, Panama, Peru, Qatar, Saudi Arabia, Solomon Islands, Swaziland, Turkey, and United Arab Emirates. An e-Visa is an official document issued electronically by ROC (Republic of China) overseas missions that allow foreign nationals to enter and travel in Taiwan. When an e-visa application has been approved, applicants are required to present the printout of the e-visa at the immigration checkpoint for verification upon arrival in Taiwan. The Taiwan e-Visa costs 54 USD. Additionally, there is a service fee of 25 USD for standard processing. For rush processing and super rush processing the service fee is 55 USD and 75 USD, respectively. 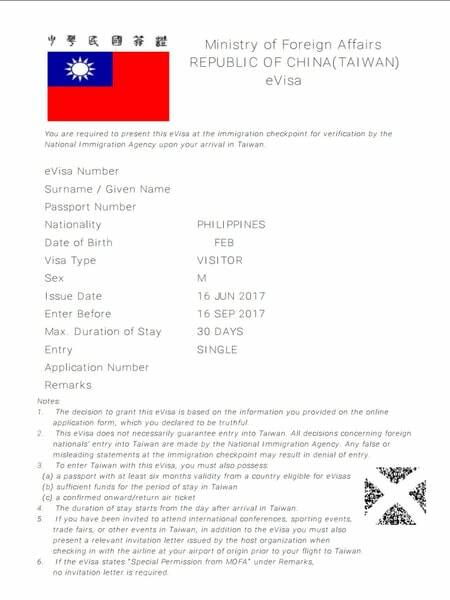 The Taiwan e-Visa is valid for 90 days after issue. This means you must enter Taiwan within 90 days. In addition, it is a single entry visa and allows for a maximum stay of 30 days. What conditions must the applicant’s passport meet for the Taiwan e-Visa? Applicant’s passport should have at least 6-months validity from the time of entry into Taiwan and at least one blank page. How will I receive the e-Visa once it's approved? Upon approval, we will send you the e-Visa as a PDF via email. You will need to print this out and take it with you when you travel to Taiwan. No, visitors to Taiwan must obtain an e-Visa prior to arrival. The only exception to this rule are nationals of Turkey. If your new arrival date is past the validity date of 90 days, then you must obtain a new e-Visa. Mainland Chinese residents are not eligible to apply for an e-Visa. Prior approval from the Taiwanese government may be required, and the traveler must hold an entry and exit permit prior to traveling. Please contact your appropriate government agency for more information. Taiwan is one of the most developed countries in Asia, and millions of tourists go there every year. The reasons vary, but if you want excitement and good food, Taiwan is one of the best places to be. The landmarks are fascinating, you can get around quite easily, and you can have fun 24/7 if you want. Most tourists limit themselves to the capital city, Taipei, but you should know that Taiwan has many other locations that are hard to forget. Before packing your bags and leaving for Taiwan, it is recommended that you do a little bit of research just to know what to expect. Read the tips below for a more pleasant trip. You may want to purchase an EasyCard once you land in Taipei. It will grant you access to public transportation such as buses, MRT (mass rapid transit,) taxis, and you can even use it make payments at some restaurants and convenient stores. It will save you the trouble of carrying too much cash on you. Plus, you need to remember that in Taiwan, while there are places where you can pay using your credit or debit card, most of them prefer cash. However, an EasyCard may help you. You can buy it at any 7/11 you find, but at train and metro stations as well. Tourists love it, and so will you. If you are a foodie, you will love Taiwan. The food there is absolutely fantastic, and while it may be difficult for you to find vegan food, you can still enjoy a vast variety of dishes. Alongside vegans, there are Muslim people. It can be challenging to find halal food in Taiwan since they use pork gravy on almost all dishes they cook. You may want to research some locations that satisfy your diet, but it will not be easy. Other than that, you will love Taiwanese food, and you cannot get enough of it. Not to mention that you can go at night bazaars where you can eat all kinds of delicacies. They may all be on a stick, but they are generally to die for. Eat something sweet, listen to music, and if you are up to it, you can dance. Taiwan has a fantastic nightlife. You will even see children way past their bedtimes dancing and laughing with their parents in night bazaars. Tough luck for the parents who have to wake them up in the morning, but at least they have a lot of fun. If you worry about communication, you will have a tough time. Taiwanese people understand English, but most of them are too shy to speak it. It may be difficult to get around when nobody can explain anything to you. Lucky for you, you have technology at hand, and that will help you a great deal. Even so, if you want to make an extra effort, you should try and learns a few words in Taiwan’s official language. It is not Chinese Mandarin, but Taiwanese Mandarin. You would think that they are pretty much the same thing, but in reality, they are very different. Even if most of them do not understand a word you are saying, people in Taiwan are very nice and welcoming. They will still try to help you with directions and whatnot in case you need them. Children may be more helpful since they speak English better, but as far as hospitality goes, they are all the same. That makes Taiwan a safe destination for travel. As you can imagine, petty crimes still happen, but so does in the rest of the world. Keep your jewelry hidden and your devices close and tight, and you should be fine for the entire duration of your trip. The best thing that you will find in Taiwan is the 7/11. The ones in big cities are open 24/7, which proves to be very helpful after a night out. Plus, they are very well equipped. Even if you forget something at home, a 7/11 will save you. You can find there anything from chargers and transformers to EasyCards and bus tickets. There are very few things you cannot find in a 7/11 in Taiwan. One thing that you should always remember is etiquette. People in Taiwan are very patient, and they will wait in line for hours if they need to. Without complaining or making a scandal. They just sit tight. Taiwanese people are civilized and organized. You cannot be that tourist who spoils it. Just stand in line as well and be quiet. Plus, in Taiwan, there are very strict rules about this sort of things. For example, you will get a very nasty glance if you sit on a seat destined for pregnant women, even if there is no pregnant woman around. The same goes for handicap spaces. Also, you will see that people have a particular way of standing in line waiting for the metro. You will see the lines on the floor. What you will notice in Taiwan is that all locations are very clean, but there is no garbage bin around. For them, public garbage bins are an invitation for filth, foul smells, and insects. So, if you travel to Taiwan, you need to hand your garbage to a garbage person. They go around the cities with an ice-cream-like truck to collect trash. Sometimes, you will see people running behind them. If you eat something and need to dispose of the plastic wrap, just put it in your pocket or bag and wait for a trash truck to come around. Taiwan should be definitely on your bucket list. The country is clean, the people are nice, and if you ever go there, you will miss the food greatly. Taiwanese people do not have many rules, except maybe for no drink and food in the public transportation system. Sounds reasonable, doesn’t it? Other than that, you will have a lot of fun while there. Not to mention that vacation there is not very expensive. It is a lot more costly to go to Japan, for example.